Ten years ago, Linda and Jim Everett were backpacking when Linda realized the protein bar she had brought was not gluten-free. Linda found out she has Celiac’s disease in 1979 and has been eating gluten-free ever since, but that day in the forest was discouraging. She told her husband that she was going to make her own bar to have for any occasion. 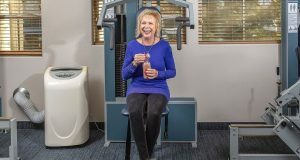 Linda says, “I went to my kitchen and combined healthy, wholesome, all-natural ingredients without preservatives.” What she came up with she calls the Jete Bar (pronounced “jetty”). Now Linda distributes her Jete Bar to twenty-one stores in the Treasure Valley, Ketchum, and Washington. She even sells her bars from her website and ships them to customers across the country. Soon, Linda’s website will have a feature for subscriptions. Additionally, Linda has a booth at the Capital Market three Saturdays a month during the summer. Linda makes her bars with non-GMO ingredients; they are sulfite-free and vegan. The bars are loaded with healthy carbs and low sugar. They do contain peanuts as a warning for those with allergies. The main ingredients are peanut butter, organic apples, organic coconut, organic coconut sugar, organic golden omega flaxseeds and dried prunes. Most importantly, Linda’s bars have no preservatives. This is the one downside, resulting in a much shorter shelf life. The bars can stay on a shelf for two weeks and in the freezer for six months. It is also an upside, as who wants to eat artificial preservatives? Definitely do not keep the bar in your gym bag for weeks! 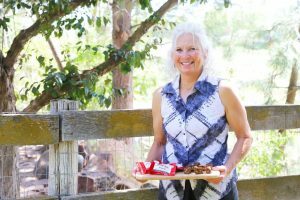 Linda wants to give credit to her first original employee, Lauren Zimmerman, who still meets her every Monday to prepare, bake, and package the bars. Her son Travis faithfully puts labels on the wrappers every Sunday. She is also thankful for Trina Bannister, who does her accounting. John Glerum from Boise State Small Business, and Dan Harrington, both provide specific small business counsel. 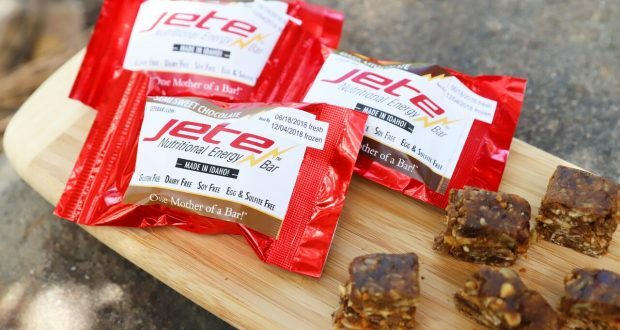 Jete Bars are available in three delectable flavors: Dark Chocolate (which tastes just like a brownie), Semi-Sweet Chocolate (which tastes like old-fashioned chocolate chip cookies), and Cranberry/Raisin (equally scrumptious). 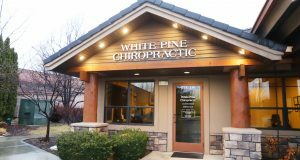 Look for the list of participating local stores, and order online, at www.jetebar.com.